At morning we left camp so early. Some tents were destroyed from strong rain. Wet tents and luggages we gave to the bus and continued in our trip. After long way through black desert we joined to our well known route “1″, the main way around Iceland. 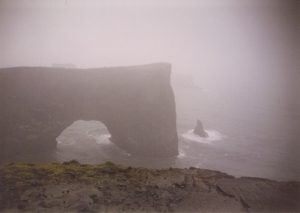 It was raining and Iceland showed us its right face. We stopped near of Seljalandsfoss waterfall. It was interesting, because it was possible to go underneath waterfall via small pathway. Wet shower from waterfall didn’t upset us, because we were wet enough from rain. After Seljalandsfoss we visited Glufurarfoss. It was known waterfall from saga, where some old well known Viking hide a big treasure. We didn’t find it, unfortunately. Our next stop was black beach Dyrholaey. Strong surge on black beach made impressive view. It is also possible to see stone gate in the sea. I gave up this exhibition, because I wasn’t in mood to get wet next time. All our things hanged in the bus didn’t dry, and water was everywhere around us. 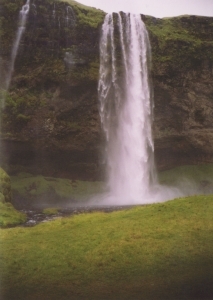 Our last exhibition was waterfall Skogafoss. At evening we reached National park Skaftafell. There, near of a big iceberg we built our tents, made some shower and tired we went to sleep into our wet tents.